Looking for Rancho Mission Viejo bee removal? The Bee Man technicians are highly trained, professional bee removal experts who make your safety a high priority. Bee swarms and infestations can be frightening and cause serious property damage if not resolved quickly. When a bee gets trapped inside a home, it can be very frightening. First of all, know that single bee is known as a scout bee. Unfortunately, scout bees get trapped indoors while searching for an ideal hive location. The most common ways scout bees come into a home is through the chimney, canned lighting or vents. 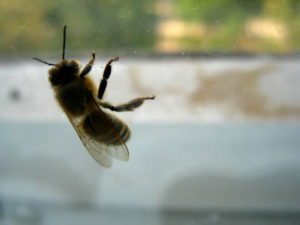 Once inside, scout bees will try to exit via the nearest light source, which in most cases is a window. As a result, the bee will buzz along the window pane looking for an exit for a couple of hours before it succumbs to exhaustion and dies. Trapped scout bees are not dangerous. They are not territorial because there is no hive for them to defend. They are simply lost and looking to get back outside. One of the simplest ways to help the trapped scout bee escape is to turn off all the lights and open a door or window that will emit a light source. Bees are biologically programmed to head towards the light and will often leave by themselves. Regardless of your bee infestation, The Bee Man offers professional bee removal services. Although trapped scout bees are not very dangerous, please refer to our safety tips here. Finally, for your safety, if you need any Rancho Mission Viejo bee removal, please contact The Bee Man at (949) 455-0123.